We are continuing to make Kehilla a more welcoming and inclusive space for all of our members. All of us appreciate it when other people see us as who we are. For trans* people pronouns can be a constant source of being seen and affirmed when preferred pronouns are used by others; conversely the absence of accurate pronouns denies a critical piece of recognition and affirmation of identity. Kehilla’s intention to build gender pronoun language in our community culture is part of gender-inclusion efforts that reverse the invisibility caused when the wrong pronouns are used. As a community of spiritual practice, it feels especially important that Kehilla be a place where everyone can be seen and affirmed in all of who we are. So soon you’ll see a set of pronoun stickers next to our nametags. Everyone has the option to add a pronoun sticker to your nametag, to let others know which pronouns you use. 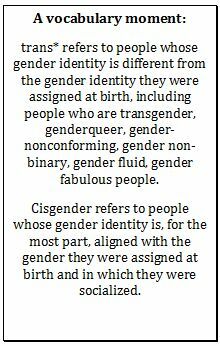 By using a sticker, cisgender people can support others in our community for whom “pronoun autopilot” doesn’t work well. Whatever our gender identity, all of us have some experiences of resonance with the gender we were raised in, and some experiences of dissonance with the gender we were raised in. We can all lean into those experiences to cultivate our compassion for ourselves and each other as we navigate this complex and shifting terrain of gender identity.